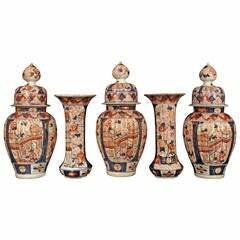 A fine and most charming complete set of three German 19th century porcelain and ormolu lidded urn garniture set. The central urn is raised by an elegant pierced ormolu base with fine foliate feet and a pierced and beaded rim. The body displays a beautiful lightly fluted design throughout with fine gold foliate patterns and a colorful central scenes of young men serenading beautiful maidens. Each urn display a fine removable lid with a wonderfully executed bird perched on top. Each outer urn display a similar shape and design also displaying fine foliate designs and beautiful central hand painted scenes framed within a gold berried laurel band. Graceful hand painted porcelain urn with lid. The raised gilt cartouche with a female figure in country scene artist signed. The back with hand painted floral decoration. A good quality pair of large 19th century classical gilded ormolu urns, each with masked handles to the sides, raised on green marble plinths with wreaths on. A good quality pair of 19th century Berlin porcelain lidded vases. Each with Swan finials to the lids, floral decoration and panels depicting horse man.